The R and A today announced the Great Britain and Ireland team to face the United States in the 40th Curtis Cup match which will be played at Quaker Ridge, New York fState, from June 8 to 10. GB and I will defend the historic trophy after securing an 11½-8½ win over the United States at Dun Laoghaire in Ireland two years ago. An eight-player team and one non-travelling reserve have been selected for the 2018 match with five players from England featuring alongside two Irishwomen and one Scot, 18-year-old Shannon McWilliam (Aboyne) from Torphins (pictured below). With five players aged 20 or under, it is one of the youngest GB and I teams chosen for a Curtis Cup match. 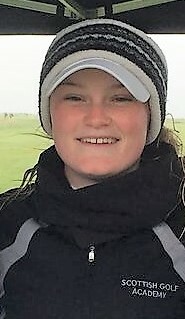 The GB and I team includes 16-year-old Lily May Humphreys who won the 2018 Helen Holm Scottish women's open amateur stroke play championship at Troon last weekend to add to the Girls' British Open Amateur Championship and English Women’s Amateur Championship titles she won last year. Olivia Mehaffey and Alice Hewson will make their second appearances for GB and I in the Curtis Cup after featuring in the winning side at Dun Laoghaire in 2016. Elaine Farquharson-Black, who will captain GB and I in the Curtis Cup for the second time, said, “There have been a number of players throughout Great Britain and Ireland who have been in impressive form recently and it was a difficult decision to select only eight. Ireland’s Leona Maguire, currently the number two golfer in the Women’s WORLD AMATEUR GOLF RANKING™, will turn professional next month and has ruled herself out of contention for selection, while England’s Isobel Wardle, who was also named in the provisional GB and I squad, has decided to focus on undertaking her school exams. In 2017, Clyburn finished second in the English Women’s Amateur Championship and represented Great Britain and Ireland in the Vagliano Trophy match against the Continent of Europe. She has recorded top ten finishes in several collegiate golf events representing North Carolina State University including the Lady Puerto Rico Classic, the Ocean Course Invitational, the LSU Tiger Golf Classic Women's Collegiate Tournament and the Dr Donnis Thompson Invitational. Fuller started the 2018 season with a runner-up place in the Portuguese International Ladies Amateur after losing out in a play-off to her English compatriot, Isobel Wardle. Last year, Fuller won the English Girls Open Amateur Championship, finished second in the ANNIKA Invitational and secured top five positions in the European Young Masters, the German Girls Championship and the Dutch Girls Junior Open. Grant is a former R and A Foundation scholar and in 2017, won the Irish Women’s Close Championship for the second time in five years following her success in the event in 2013. Grant led the qualifiers after the stroke play stage of the 2017 Ladies British Open Amateur Championship at Pyle and Kenfig. Hewson will make her second appearance in the Curtis Cup for Great Britain and Ireland after playing in the 2016 match at Dun Laoghaire. She has recorded three wins in collegiate golf representing Clemson University including the Clemson Invitational, the Cougar Classic and the Lady Paladin. Hewson has won two gold medals representing England at the European Amateur Team Championships. Humphreys won the 2018 Helen Holm Championship at Royal Troon last week. Strong performances in 2017 saw her capture the Girls British Open Amateur Championship, the English Women’s Amateur Championship, the European Young Masters, the Sir Henry Cooper Junior Masters and the Junior Orange Bowl International. She represented Great Britain and Ireland in the Junior Vagliano Trophy in 2017. Lamb won the Smyth Salver as the leading amateur player at the 2017 Ricoh Women’s British Open at Kingsbarns and finished runner-up in the Irish Women’s Open Championship in the same year. The Englishwoman also represented Great Britain and Ireland in the 2017 Vagliano Trophy match against the Continent of Europe. In 2016, she won the Ladies British Open Amateur Stroke Play Championship. McWilliam began 2018 in good form after winning the Border Championship by six strokes at East London in South Africa. She finished runner-up in both the 2018 and 2017 "Helen Holm" Championship and the 2017 Scottish Girls Open Championship. McWilliam also won the Scottish Ladies Order of Merit in 2015. Mehaffey is playing in her second Curtis Cup match for Great Britain and Ireland, having featured in the winning side in 2016. That same year she won the Irish Women’s Open Stroke Play Championship and Welsh Ladies Open Stroke Play Championship. In 2018, she finished T-1 in the Northrop Grumman Regional Challenge, her first collegiate tournament representing Arizona State University, and has been selected for the International Team to play against the United States in the Arnold Palmer Cup at Evian, France in July. The Curtis Cup has been won 28 times by the United States and 8 times by GB and I with three matches tied (1936, 1958 and 1994).